You are here: Home / Blog / What is the Best Snow Blower for Home Use? What is the Best Snow Blower for Home Use? When winter comes a snow blower can turn out to be your best friend. When you live in an area that is subject to frequent snowfall, you’re probably considering what is the best snow blower to get you through the harsh winter months. This requires a great deal of thought when shopping around because there are different types of machines and not all models are suited for specific jobs. For instance, if you typically get just a light snowfall here and there with an occasional snow storm, then a smaller machine would suit you just fine. On the other hand, if you experience frequent, heavy snowfall and snow storms then you should save up for a heavy-duty machine that can take on the job with ease. Where you live is a key factor to consider when choosing the right snow blower. Any type of power equipment you’re going to buy should be considered an investment. When you’re looking at something that’s going to cost upwards of a few hundred bucks, you want the best and you need to know it will work. Whether you are going to be clearing a 2-car driveway or the sidewalk, it just has to work because nothing feels as great as a job well done. Knowing your options will help you make a well-informed decision to know just what is the best snow blower for your needs. Will you be clearing a level surface such as a deck, or do you have a steep driveway? These are factors that will need to be taken into consideration. It can also help you save money from buying a pricey unit that you don’t really need and with Christmas nearing by who wouldn’t want to save a few extra bucks? An inexpensive recommendation to prevent falls. According to this winter’s snow predictions due to the El Niño pattern, we are expected to receive higher than average snowfall. If you don’t already own a snow thrower or if the one you have has seen its better days, now is the time you’ll want to start looking! We may be in for a rough winter where it’s really going to test the boundaries of your machine. Knowing what is the best snow blower for the type of snow you’ll be clearing and the area that is being cleared could mean the difference between getting out of the driveway and to work on time or having a really bad day. No worries – for those who aren’t sure what is the best snow blower to look for I’ve covered some of the basics along with the best picks for each category. Battery power provides the ultimate freedom. No gas. No cords. Snow Joe iON18SB. Battery powered snow blowers, also known as cordless electric snow blowers, give you an advantage over the competition. These snow blowers give you the power you need with the convenience of portability. There’s no cord to drag around while you’re clearing out the driveway and you don’t have to worry about refueling or maintenance. These run on a rechargeable battery you can just charge it up on and go. If you were trying to determine what is the best snow blower to pack up for a week-long trip to your winter getaway cabin in the mountains you should give one of these some thought. These are also much easier to handle because they’re generally smaller and lighter in comparison to other models. Keep in mind that they’re also typically narrower in width so these would be most suitable for smaller driveways and light snowfall – not that they can’t handle clearing an occasional heavy layer of snow, but you may have to make several passes to get the job done. I’ve actually listed two different battery-powered models below: a Snow Joe for light to medium duty and a GreenWorks model – the most powerful battery-operated model of snow blowers. For more information, read our in-depth review of the Snow Joe iON18SB. This 40V model also comes in a wider 21-inch version. Same great features but offers wider snow clearing capabilities. If you have a large property then the Snow Joe iON21SB-PRO might be a better choice for you. Lightweight design (32 lbs) to easily clear sidewalks, driveways and decks. 40 V 4.0 Ah EcoSharp rechargeable lithium-ion battery provides up to 50 minutes of whisper-quiet run-time. Steel auger with 2 rubber blades moves up to 500 lbs of snow per minute; cuts a path 18 in. wide by 8 in. deep without damaging surface. ETL approved; Full 2 year warranty; Energy Star certified. You’re looking for a snow blower that will serve your needs, but let’s say you don’t have a large garage or adequate place to store it. This Snow Joe cordless single stage brushless snow blower is just the ticket. It is very lightweight, weighing just 32 pounds, so it’s easy to hoist up onto a deck you need to clear off. It’s also a great unit if you live close to your neighbors as the Ecosharp rechargeable 40V lithium-ion battery delivers whisper-quiet performance, which they’ll appreciate. The steel auger consists of 2 rubber blades that can push through and move up to nearly 500 pounds of snow. The battery will last for up to 50 minutes of run-time, although this may vary depending on the intensity of the job at hand. It is extremely user-friendly with a quick start at just the push of a button and an adjustable handle to fit multiple users. There’s also an LED headlight that is integrated to improve visibility if you just happen to be one of those who like to get up and clear the driveway before the crack of dawn. As mentioned earlier, here’s the wider version: Snow Joe iON21SB-PRO. It’s the same model except it’s 21″ wide and has a larger 5.0Ah battery as it requires more power to operate. Snow Joe has a very good reputation with consumers. They make a full range of lawn and garden tools for homeowners. If you want to learn more, visit their website. Includes: Snow Thrower, 2.0AH Battery and Charger, and an Owner’s Manual. For more information, read our in-depth review of the GreenWorks 80V snowblower. Single-stage snow blower GreenWorks Pro 80-Volt cordless blower quickly clears driveways, sidewalks and patios with a 20″ clearing path and handles snowfalls up to 10-inches. 80-volt max Li-ion battery provides 45 minutes of run-time. Its brushless motor technology is quiet and maintenance-free. Up to 45 minutes of run-time under load and fully charged 2.0AH Battery. DigiPro digital controlled brushless motor offers reliability while delivering greater torque and efficiency. 20″ clearing path quickly clears snow off your driveway, patios and walkway. Up to 10″ of clearing depth. Up to 20 foot snow discharge. Dual LED Lights allow for better visibility while clearing snow. Easy Fold System for storage or compact transportation. Compatible battery and charger models GBA80200, GBA80400 and GCH8040* (Additional high capacity batteries coming soon). View or download the MANUAL for the GreenWorks 80V. Now if you’re in need of something that is capable of a bit more power, but still like the advantage of a battery-powered unit then consider the GreenWorks Pro your friend. This snow blower runs efficiently on a rechargeable 80V Li-ion battery to clear paths up to 20” wide and up to 10” deep. It can throw snow at up to 20 feet away with a 180° rotating chute to clear the way. It gets even better! This snow blower has an easy fold system so you can store it compactly as you see fit whether it’s in the garage or the tool shed during the off-months when you won’t be needing it. Let’s face it, snow often falls at night. Two LED lights are necessary. The winner for me with this one, though, is the rapid charge. While the battery will give you up to 45 minutes of run time, you can simply recharge the battery if need be and get right back to what you were clearing off in less than an hour. That’s probably the fastest among any other cordless unit which typically take a couple of hours to recharge. When it comes to efficiency, that really makes a big difference to get the job done when you’re trying to get out of the house. Another really considerable aspect is that GreenWorks products are backed by a 4-year warranty from the manufacturer for defects, parts, and repairs or replacement parks with a 2-year warranty on the battery. If you have a large yard to clear then I recommend buying an extra battery, specifically the 4.0Ah battery. If you do, you’ll never have to worry about running out of battery power while you’re clearing snow. With two batteries you can be continually be charging while you work. Yes, the batteries are expensive. There’s a lot of power packed into them and they’re quite large. It takes a lot of energy to clear snow. Hopefully, battery technology will evolve into a more affordable and compact form in the future. One can only hope. Electric snow blowers are affordable but provide less freedom. An electric snow blower runs on the power of electricity with a power cord that you just plug into your standard outlet. For these particular models you will need to purchase a heavy-duty extension cord, preferably one that is rated for outdoor use. There is an upside to this as you never have the worry of not getting the job done before your battery goes dead and waiting around for it to recharge. Once you are all plugged in you are ready to go without having to stop until the job is done. With most models, the extension cord length typically used is 100 feet or more so these would be great for short driveways and walkways that you want to clear. Perhaps you have a small driveway or would like something that can clear off the back patio for entertaining. An electric snow blower is a great alternative to shoveling for taking on small to moderate snow clearing duties around your home. These are capable of clearing up to 6-8 inches of light powdery snow or up to 4 inches of dense, packed snow. The corded electric snow blowers are also easier on the wallet as they start at lower prices than their battery-powered counterparts. This is primarily because cordless electric snow blowers are still relatively new to the market. Corded snow blowers, however, are far more popular and there is a greater variety to choose from so you can find cheaper models that fit your budget. Read our guide on buying the correct extension cord for your snow blower. A dependable and efficient electric snow blower. Updated Snow Joe snow blower. Increased reliability. Ideal for quick snow pickups on mid-sized driveways and walkways. No gas, oil or tune-ups make it effortless to start and maintain. 3 W LED light for safe nighttime clearing. Powerful 15-amp motor moves up to 800 lbs of snow per minute. Steel auger with 2 rubber blades cuts 21″ wide and 12″ deep in one pass. 180° adjustable directional chute throws snow up to 20 feet. View or download the MANUAL for the Snow Joe SJ625E. 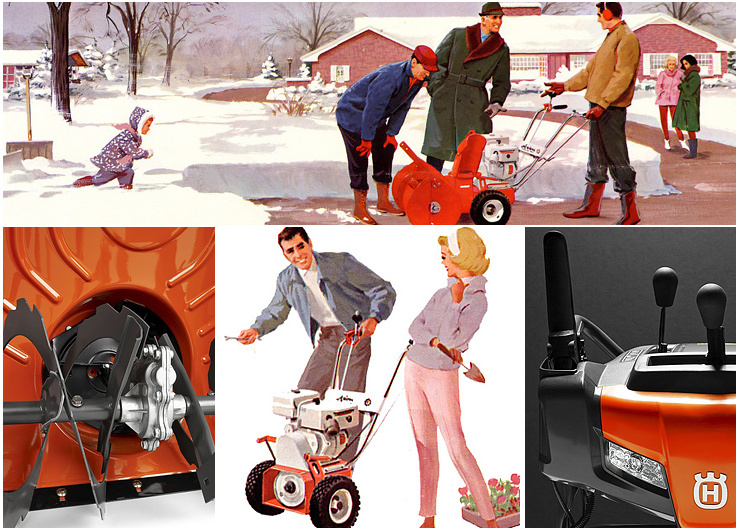 Yes, it’s another Snow Joe in this line up for the best snow blowers and with good reason. I present to you the Snow Joe Ultra SJ625E, one of the newer models by Snow Joe in their electric snow blowers. This blower operates on a 15-amp motor with the power to push through as much as 800 pounds of snow per minute and clears a path of 21 inches wide by up to 12 inches deep. Has a steel auger with 2 rubber blades provides impressive plowing capability and a scraper blade that is safe enough to use on a deck after a heavy snow fall without causing damage. Not to be fooled by the lightweight, compact design of this model it is definitely durable to withstand the dreaded task of clearing through even the wet stuff. Designed for heavier snowfall on mid-sized driveways and walkways. The all-terrain tires on this model allow it to glide through the snow making it much easier to maneuver and turn. The adjustable discharge chute rotates 180° and is equipped with a deflector that can also be adjusted to throw snow at up to 30 feet away. This is a great machine for beginners as it is super easy operate. There’s even a 3-Watt LED light equipped to the unit that works when the machine is running (it’s powered by the motor- no batteries) so you can see in the wee hours of the morning to clear your driveway before heading off to work. It also features a safety button that must be pressed before pulling back the handle as a safety measure. If you were to determine what is the best snow blower in terms of efficiency and convenience, this machine is a step in the right direction. More reviews on single stage snow blowers if you’re still unsure. ✓TIP: Do not operate the equipment without wearing adequate winter garments. Avoid loose fitting clothing that can get caught in moving parts. Wear footwear that will improve footing on slippery surfaces. When you live in an area that is prone to getting at least a foot of snow like say Syracuse, New York, then you need to know what is the best snow blower for the job. You need something that has serious horsepower to it. Gas-powered snow blowers produce the most power among all other models and give you the same freedom as cordless models. They’re usually a little larger than other models as well as heavier so it is certainly something the keep in mind when you’re thinking of storing it. Trust me, this is definitely not a machine you would want to have to haul downstairs to store in a basement! Blizzard? No problem. This is the machine you want on your side. The larger clearing swaths of these larger models makes them more ideal for larger clearing areas such as long driveways or wide walkways. Although, that’s not the only reason you might need a larger machine. They also have the power to clear through dense, wet snow efficiently. So if you happen to be one of those ‘lucky’ residents that receive the lovely mound of snow left behind at the end of your driveway from the snow plow each morning then you, my friend, need a gas-powered snow blower. They’re considerably more costly than electric models, but it’s worth it when you need. There just is no comparison to the power and speed these machines are capable of. Best heavy-duty snow blower for the money. Look no further! 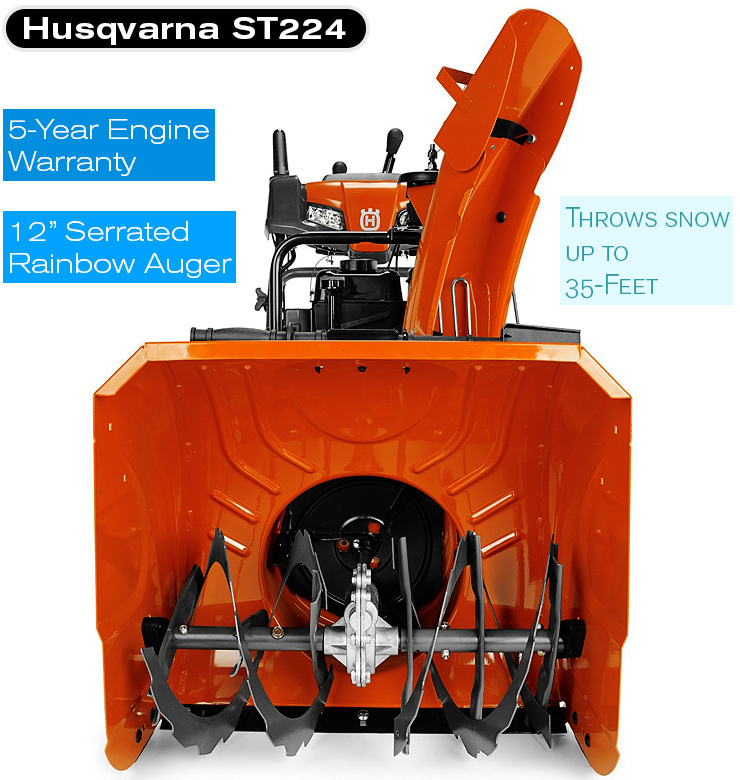 If you want to learn more, read our in-depth review of the Husqvarna ST224 two-stage snow blower. Friction disc transmission : For easy speed changes depending on snow conditions. Ribbon auger : The ribbon auger mixes air into the snow, which makes the snow easy to handle and thereby ensures efficient clearing. Electric starter: Connect to a power outlet and start the engine by pressing a button. You don’t have to worry about having a dead battery. LED headlights allow you to see your path in the dark. Oversized / X-trac heavy tread tires give you improved traction on slick surfaces. Adjustable skid shoes: Adjust the space between the auger housing and the ground in order to protect the ground surface. Aluminum auger gearbox: Durable auger gearbox with 5-year warranty. Remote chute rotator and deflector: Controlled by levers on the control panel. Loop handle: For easier grip and overall control. Clearing stick: Comes with a clearing stick if the chute gets clogged. Quiet muffler: Minimizes the noise level. View or download the MANUAL for the Husqvarna ST224. This heavy-duty snow blower will get you through the winter with very minimal effort and a lot of nice extra features. A 208cc Husqvarna engine powers this baby to push through a snow accumulation from 2-12 inches with a clearing path of 24-inches. The 15-inch tires have excellent tread that can push through heavy snow for easier maneuverability and it is self-propelled, which makes it that much easier on the back. It’s practically effortless to operate. The machine is on the hefty side at 240 pounds, although this is what you would need if you have a steep driveway to give you adequate traction for clearing. You get a lot of snow blower for your money. The fuel tank of this snow thrower holds 2.7 liters of gasoline which will give you plenty of juice needed to clear out a large area. There is a 180° remote chute rotation with a remote deflector that can throw the snow at a relatively far distance depending on the consistency of the snow. I must say, the heated handlebars are also a really nice added touch to make the chore of clearing through snow a tad bit more pleasant while working in freezing conditions. Excellent construction — as you’d expect from Husqvarna. ✓TIP: Stop the engine (motor) whenever you leave the operating position, before unclogging the collector/impeller housing or discharge chute, and when making any repairs, adjustments or inspections. Track-drive allow you traverse up and down hills. Note: Troy-Bilt also makes a model that might confuse you. It’s the : Troy-Bilt Vortex 2890. This one has wheels, not tracks. They should have used a different number to prevent from confusing consumers. View or download the MANUAL for the Troy-Bilt Storm Tracker 2890. The Troy-Bilt Storm Tracker 2890 2-stage snow blower is unique because it comes with a trck drive system which makes it suitable for extreme winter conditions — especially when you need to clear snow on hills. Track drive provides a level of traction that ordinary wheels just can’t give you. It’s akin to a snowmobile. You wouldn’t think of putting wheels on a snowmobile. Same logic applies here for deep snow conditions. Track drive design will handle any terrain you throw at it — especially inclines and hills. 2-ply polymer tracks provide added durability under all winter conditions. Touch ‘n Turn power steering allows you to turn with the touch of a finger. Heated hand grips keep you warm even when it’s cold. One Hand operation locks in speed, freeing 1 hand to operate chute and pitch controls. In-dash headlight and reflective stripes on the auger housing provide added safety in low visibility conditions. All-wheel drive with choice of 6 forward and 2 reverse speeds gives you control and versatility in winter conditions. Extended chute design minimizes snow from blowing backwards. Track drive is useful for deep snow conditions on inclines and hills. What’s the Best Snow Blower for Home Use? Ultimately, it depends on where you live and the type of property you need to clear of snow. Rest assured that when you seek out what is the best snow blower for you, there IS one out there to fit your needs whether you have a small suburban property to clear or need to cover a large area. Be ready for whatever mother nature has in store for you this winter with a top of the line machine that will get the job done. Get ready because a new breed of snow clearing machines are beginning to grow in popularity — three-stage now throwers. Go slower in deep, freezing or heavy wet snow. Use the drive speed control, NOT the throttle, to adjust speed.